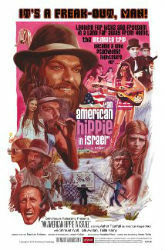 The title, An American Hippie in Israel, pretty much tells you everything you need to know about this movie. 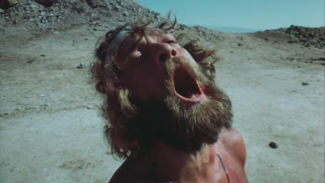 It is a shaggy dog story, that follows Mike (Asher Tzarfati), a hairy, barefoot wanderer who finds himself in Israel. He meets up with a young woman named Elizabeth (Lily Avidan), who offers him a lift. From there the movie goes from vignette to vignette as Mike and Elizabeth gather a band of followers (or perhaps a cult if you’re feeling less kind), see those followers wiped out save for one couple, and then they all decide to go for a pleasant drive. The story culminates with both couples trying to make a new life for themselves on an island that is about 300ft off shore. It goes about as well as you would predict. An American Hippie in Israel ultimately feels like a Jodorowsky film that can’t commit to any sort of allegory. It throws out messages of hope and peace, and then turns around and wallows in the ugly cruelty of man, before side-stepping that to bring an anti-corporate message. It does engage in some psychedelia, not as much as I would have hopped, and not in a competent manner. Perhaps the most striking moment is Mike daydreaming about clambering up a hill with a giant hammer to bonk men with reel to reel tape machines for heads. It’s apropos of nothing, and only severs to tell me that Mike likes Warner Bros. cartoons and hates recording equipment. 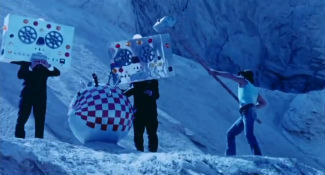 Scene from An American Hippie in Israel or They Might Be Giants video? You decide. By the third act, Mike has the brilliant idea to go live on a desert island with his friends. They bring with them only a raft and a small amount food. The groups immediately start bickering, and run out of supplies. Mike is the only one healthy enough to swim, but thanks to two ghost sharks(?) lurking in the water, he can’t leave the island. I suppose the sharks could be some kind of mental breakdown or Mike’s fear manifested, but the movie gives you zero to work with, so I’m going with ghost sharks. The Israeli setting is at once both familiar with its western style cities, and exotic with its desolate rocky landscape. There is no particular reason the story is set in Israel, and I wish they would have incorporated it in the story somehow. But like many things in An American Hippie in Israel, it’s a missed opportunity that keeps the movie from being exceptional. Grindhouse Releasing has released a beautiful Blu-ray. For all this film’s faults, looking bad is not one of them. An American Hippie in Israel falls short of being a revelationary psychedelic experience but it still manages to entertain.